Dr. Manoj Mishra Taking Life And Meditation Chikitsa Ratna Award from Shri Ravi Sharma (Founder of Life And Meditation) for Excellence Achieved in the sector of medical social welfare and serve totaly free the needy and poor patients regularly. High School – Ist Division with distinction in Science in 1987 from U.P. Board, Allahabad. Intermediate – Ist Division with distinction in 3 subjects PCB in 1989 from U.P. Board, Allahabad. M.D. with honours 1992 Irkuisk State Medical University Russia. Working as endoscopist M.D. with honours 1992 Irkuisk State Medical University Russia. 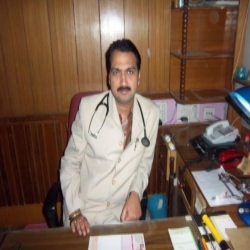 Working as endoscopist, physician, monogy director Nirmal Hospital for last 10 years. MCI Registration in 2000 reg.no.19996. Diploma in family health 2004 DFH. Post-Graduate course in tuburculous 2004. Post-Graduate course in Diabetes 2007. Received Doctor of Millennium Award 2000 by association of Medical Sciences, New Delhi. Actively participated in 50 Conferences / Seminars / Workshop till date. Published 5 papers in Journal. Respiratory Critical Care, Cardiology / Ventilator. Association of Medical Sciences 2000. Life Member of Indian Medical Association [IMA] 2000. Association of Physicians of India 2003. IMA College of General Practitioners 2005. IMA Academy of Medical Specialties 2005. Indian Society for Parental & Enteric Nutrition [ISPEN] 2005. Indian Society of Gastroenterology 2005. Research Society for the Study of Diabetes in India [RSSDI]. TO SERVE THE POOR PEOPLE. TO SERVE THE NEEDY & POOR PATIENTS. WE CARE, FROM THE HEART! SERVED MORE THAN 2000 PATIENTS OF "RSBY" IN LAST 2 YEARS. SEE ALMOST 50 PATIENTS PER DAY FREE. TUESDAY 'OPD' CONSULATION IS TOTALLY FREE FOR ALL PATIENTS.